Richard Lovelace was the son of Richard Lovelace Senior, of Ladye Place in Hurley, and his wife, Anne the daughter of Richard Warde of Hurst. Of the father, Fuller says, "He was a gentleman of metal and, in the reign of Queen Elizabeth, making use of letters of mark, had the success to light on a large remnant of the King of Spain's, cloth of silver, [by which] I mean his West Indian Fleet; wherewith he and his posterity are warmer to this day". Richard Junior matriculated at Merton College, Oxford on 7th February 1584 and subsequently became a soldier. He commanded troops in Ireland, under the Lord Lieutenant, in 1599, and, for his good service, was knighted by the Earl of Essex in Dublin on 5th August 1599. 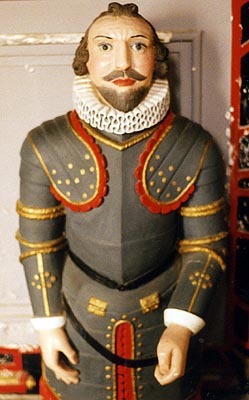 His association with the earl led, in February 1601, to his being imprisoned on suspicion of being involved in the former’s plots against the Queen. However, he appears to have been released without charge, becoming MP for Berkshire and subsequently Sheriff for that county (1610-11) as well as Oxfordshire (1626-27). Sir Richard was elevated to the peerage, as Lord Lovelace of Hurley, by Charles I on 30th May 1627. Of this man, Garrard, in a letter to the Earl of Stafford, dated 3rd June 1634, says, "Lovelace, being my neighbour, born near Windsor, I knew him well, though he was born but to £400-a-year, yet he left to his only [ie. eldest surviving] son, aged near 20, near £7,000-a-year. All got by a fortunate marriage with a rich citizen's daughter [of which an early example], she was worth to him £50,000." This lady was his second wife, Margaret, only daughter and heiress of William Dodsworth, citizen and merchant tailor of the City of London, by whom he had four sons and five daughters: Elizabeth, Richard, Margaret, John, Sarah, William, Mary, Francis and Colubria. Baptisms of all but the last are recorded in the parish registers of Hurley Church. Their heir was the eldest surviving son, John. Their eldest daughter, Elizabeth, married the regicide, Henry Marten. A younger son, Francis, was grandfather of the 4th Lord Lovelace, but should not be confused with the Governor of New York of the same name. Lord Lovelace’s first wife, by whom he had no children, was Katherine daughter of Sir George Gyll of Wydial, Hertfordshire and widow of Sir William Hyde of South Denchworth. He died at Hurley on 22nd April 1634. His widow lived on at Ladye Place throughout the Civil War, until her death in 1652. In 1642, her house was pillaged by Parliamentary soldiers and the unfortunate lady was "plundered almost to her smock".